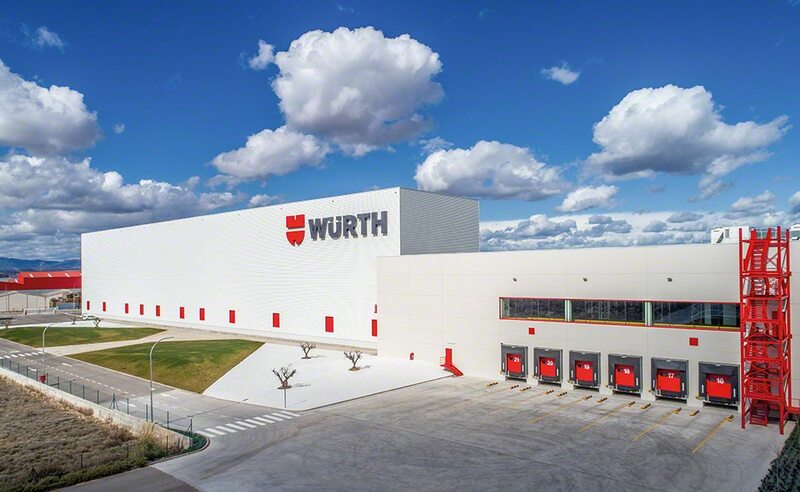 The German multinational Würth, a leading assembly and fixing materials specialist, has expanded its installations in La Rioja, Spain. This 70,000 m2 logistics centre has been developed specifically for national product supply. Mecalux put together this “turnkey” project, setting up a multi-solution design that more than meets the growing needs of Würth. One of the big advantages of our Mecalux installation is that in just 3,500 m2 we can store up to 15,000 pallets. In the pallet rack warehouse we ran before; frankly, this would have been impossible. This distribution centre, built adjacent to the company’s existing warehouses, consists of a middle installation and a 26 m high, 115 m long warehouse with five stacker cranes. We have worked side-by-side with the engineers and project managers from Mecalux to keep this project running smoothly, meaning the works never affected the customer service we give at Würth Spain. Mecalux took care of everything, down to the last detail, even using Würth’s company colours for the racks. The result is a clad-rack warehouse that holds more than 15,000 pallets and another two-floor interconnecting installation. On the lower level, goods are received and dispatched from the 12 loading docks. This floor also includes a conveyor circuit with three product entry points and two exits points. One of these input lines includes an automated system to place slave pallets when the original pallets are not in good shape. Pallets flow along the conveyors arriving to a gauge control that checks the condition of the pallet, its gaps, skids and weight. Here, a scanner also reads and sends the pallet’s information to the warehouse management system, so the goods can be approved for input into the automated warehouse. Once a pallet passes this review process, it rides a lift to the upper floor to be inserted into the warehouse. Goods are slotted into the installation by an electrified monorail system that moves the pallets into the warehouse and ensures workflows of 300 pallets/hour, 150 inputs and 150 outputs. Pallet outputs are carried out by the conveyors and electrified monorails, which shift pallets to a lift that lowers them to the bottom floor where dispatches take place. Two picking stations are enabled right in front of the electrified monorails for low and medium rotation products. These twin workstations are fitted with vacuum lift equipment to assist operators, since products prepared at these posts can be hard to handle. Operators can prepare several orders at a time through this system. Once the required product is taken from the pallet, the pallet is sent back to the automated warehouse. Another pallet conveyor system on the upper floor includes a reversible input, output line. This conveyor is linked to the pre-existing warehouse through a pallet lift that lowers pallets to the bottom floor. Picking of consumer products takes place in this warehouse. The whole system is controlled by the Mecalux Easy WMS software that works jointly with Würth’s computer system to track and manage all goods as they flow from inputs, outputs and storage. The installation is organised and monitored by a management system that uses video surveillance to oversee the different warehouse zones. Choosing the right partner was crucial. We wanted a company we could identify with, who could meet our long-term storage needs as we grew. Mecalux is the ideal company to do business with for all our logistics expansions. Mecalux supplied Würth with a broad range of solutions, through its in-house development and manufacturing, achieving better storage capacity, raising quality and streamlining customer service. But this is just the first step in a project that will continue to spearhead expansion, as it has from day one.